Health centers can utilize predictive analytics in a multitude of ways, furthering its consideration and implementation of patient engagement, patient compliance, chronic disease management, regulatory compliance, avoidable deaths, hospital readmissions, public health, waste and abuse, and health outcomes. And this is only the beginning. 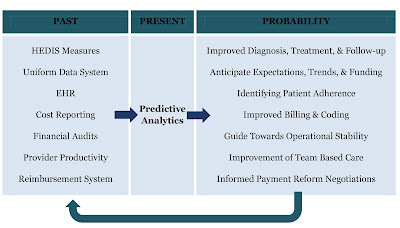 Predictive analytics is in its infancy within health care, and the exponential pace of technological advancements will identify additional uses and benefits we have yet to consider. Access this publication at no cost here and at MyNACHC.